Below are the official 2018 Hockomock League Boys Swimming All Stars, selected by the coaches in the league. Diving Champions: Oliver Ames’ Cam Bourne and Sharon’s Fallon Pfeifer. MANSFIELD, Mass. – For the opening 15 minutes, the visiting Bombardiers controlled the play, dominating the midfield and pushing Mansfield back on its heels. In the 10th minute, Will Halben cut inside on his right foot and found space on the edge of the box. His shot beat Mansfield goalie Nick Ferraz, but not the post. Five minutes later, Hornets senior midfielder Sam Hyland had the ball bounce to his foot inside the 18-yard-box and also saw his shot carom off the post, but the rebound went straight to classmate Sean Lanzillo and he buried his shot into the open net. The opening goal changed the entire outlook of the game and propelled the Hornets to a 3-0 victory over Attleboro that moves Mansfield within three points of division-leading Oliver Ames with three games remaining in the regular season. Following Sheridan’s timeout, the Hornets settled into the game, started to possess the ball better, and played through the midfield. In the 28th minute, the hosts almost doubled the lead when Cullin Anastasia started a break with an outlet pass to Lanzillo, who then fed Hyland but the shot was saved by Nick Hasenfus. Seconds later Anastasia beat the offside trap but again Hasenfus made the stop. In the 29th minute, Mansfield got another break on a deflection. Luke Devine’s run was cut off by Attleboro center backs Aidan Lancaster and Colin Levis, but the ball bounced out to Lanzillo who hit a perfect, first time shot from 19 yards that curled over Hasenfus for a 2-0 lead. In the second half, Mansfield pressed its advantage and created a series of chances. Lanzillo’s cross from the right wing was headed on target by Anastasia but saved by Attleboro back-up keeper Andre Menard and two minutes later another low cross into the middle to Hyland was cut out by a sliding Levis. In the 55th minute, central defender Sam Nugent slid a pass to spring Lanzillo down the touchline, but his cross was just behind Hyland in the middle. That turned out to be a warning for the Attleboro defense, as just a minute later Lanzillo played in Anastasia on the right and he picked out Hyland with a low cross that was side-footed in. It could have been more for the Hornets. Jared Gabrilowitz cut in from the left side and had his right-footed shot saved by Menard at full stretch. From the ensuing corner, Michael Russo was forced to clear a shot off the line. Attleboro struggled to sustain a consistent attack. Russo had a shot saved early in the second half and David Medeiros had an 18-yard shot comfortably saved by Ferraz (four saves). The best chance for the Bombardiers came in the 70th minute, as Russo got forward down the left wing and sent an inch-perfect cross to Halben at the back post only to see the shot come back off the crossbar. Mansfield (8-2-5, 8-1-4) will host Franklin on Thursday, while Attleboro (1-8-4, 1-8-4) will try to play spoiler when it hosts league-leading Oliver Ames. Attleboro, 0 @ Oliver Ames, 2 – Final – Oliver Ames scored once in each half to pick up a win over visiting Attleboro. Nathaniel Cardoza put the Tigers ahead on an assist from Chris Lawrence while Michael Nikiciuk doubled the lead, on an assist from Brandin Osborne. OAHS head coach praised the play of Cam Vella, Mason Galbato, Matt Campbell and Colin Evin. Sharon, 0 @ Canton, 2 – Final – Canton junior Griffin Roach continued his strong start to the season, netting a brace in the win. Roach scored once in each half. Mansfield, 3 @ Franklin, 2 – Final – Mansfield built a 3-0 lead over the first 25 minutes of the game and then held off a late push from the Panthers. John Cooney opened the scoring on an assist from Sean Lanzillo in the eighth minute and just three minutes later, Jared Gabrilowitz made it 2-0 on a feed from Cullin Anastasia. Nick Wisnieski converted a chance from Gabrilowitz in the 22nd minute to make it 3-0. Franklin got on the board when sophomore Sam Stowell converted a penalty kick in the 38th minute. Sophomore Lucas Mauro netted Franklin’s second goal off an assist from Nasir Brahimi. Nick Ferraz made six saves in net for Mansfield. King Philip, 1 @ Taunton, 0 – Final – King Philip Connor Mullins converted a cross from Thomas Lugten inside the area in the first half to give the Warriors the win. North Attleboro, 4 @ Stoughton, 0 – Final – North Attleboro built a 3-0 lead by halftime and converted a set piece in the second half to earn two points on the road. 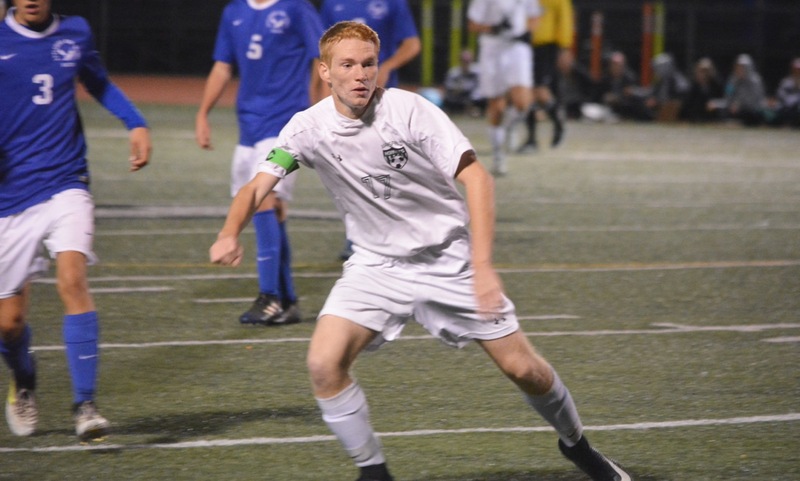 Sophomore Dylan Corrigan grabbed his first goal of the game in the sixth minute, and made it 3-0 in the 30th minute, burying a rebound chance after a terrific save from Stoughton keeper Carter Gerome. Ryan Pasquel scored on a free kick just outside the area in the second half. Click here for a photo gallery of this game. Oliver Ames, 2 @ Attleboro, 1 – Final – Maeve Hogan put OA in front with a header off a Sophia Cox corner. Briley Harnois tied the game late in the first half, but Abby Hodges popped up with the game-winner midway through the second half, off a Jackie Mills cross. Sharon, 1 @ Canton, 2 – Final – Freshman Elisa Diletzia scored with a header off a Riley Duserick cross in the closing minutes to nab the win for the Bulldogs. Freshman Olivia Rodman scored the first for Canton off a Lilah Sullivan assist. Foxboro, 1 @ Milford, 0 – Final – Lily Sykes scored the lone goal of the game with a shot from outside the 18. Katie Huether assisted on the goal for the Warriors. According to Milford coach Jay Mastaj, Olivia Marshall played well in goal with a number of saves to keep the Hawks in it and Ashleigh Starks and Juliana France both had strong games as well. Franklin, 0 @ Mansfield, 3 – Final – Click here for a recap of this game. Taunton, 1 @ King Philip, 5 – Final – King Philip sophomores Avery Snead and Chloe Layne linked up for three goals in King Philip’s win at home. Layne (three points) scored twice, both on assists from Snead, who scored once and had another assist for a total of four points. Abby Baker scored an unassisted tally and Jenna Hitchen also scored once. Samantha Tichelaar scored the lone goal of the game for the Tigers, while Grace Pimenta made 12 saves for Taunton. Oliver Ames, 6 @ Attleboro, 3 – Final – Oliver Ames scored three goals in each half to double up on Attleboro. Maggie Woods scored a pair of goals while Sarah Stevens, Kayla Lozzi, Liz Nuss and Cristina Boudreau each scored once. Boudreau added two assists while Nuss, Hannah Stryke and Cassie Gennis each had one helper. Mansfield, 2 @ Franklin, 2 – Final – Click here for a recap of this game. North Attleboro, 2 @ Stoughton, 2 – Final – Brittni Paul and Lauren Berteletti each scored for Stoughton while Katherine Munley and Kaley Gorman scored for North Attleboro. Attleboro, 0 @ Oliver Ames, 3 – Final – Oliver Ames picked up its second straight win, 25-11, 28-26, 25-22, by defending home court against Attleboro. Senior Jackie Kandar had a strong game defensively for the Tigers and added four kills and two aces. Emma Petrillo added 12 kills and Katie Flynn finished with 10 kills. Canton, 3 @ Sharon, 0 – Final – Canton picked up a sweep on the road, notching a 25-12, 25-18, 25-15 win. Erin Devine had a great match with eight kills without any hitting errors (.727). Nyah Claiborne chipped in with three aces and great defense. Sofia Connor had 12 digs and Nicole Brown added 16 assists. Mansfield, 0 @ Franklin, 3 – Final – Franklin had a strong, well-rounded attack to pick up a sweep against Mansfield. Ellie Wisniewski (ace), Meaghan Maguire (block) and Hailey Sanders all had eight kills apiece while Maggie Doyle (three blocks) added four kills. For Mansfield, Meg Hill added eight kills, Julia Harrison had six kills and Mikayla Kearney chipped in with 10 digs. North Attleboro, 3 @ Stoughton, 2 – Final – Click here for a recap of this game. King Philip, 3 @ Taunton, 0 – Final – King Philip picked up a sweep on the road, winning 25-13, 25-8, 25-23. Sydney Phillips paced the offense with 14 kills, four digs and seven service points. Grace Ely added four kills and Kat Kmetz had two kills and 11 service points. Canton, 154 @ North Attleboro, 157 – Final – Sophomore Chris Lavoie fired a career-best 37 to lead Canton to a key division win over North Attleboro. Danny Powers, Joey Vaughan and Niko Donovan each carded rounds of 39 for the Bulldogs. Aidan Weir earned match medalist honors, shooting a 36 for North Attleboro. Sharon, 174 @ Milford, 180 – Final – Sharon’s Cory Carter earned match medalist honors, carding a round of 37 to lead the Eagles. Riley Lynch shot a team-low round of 42 for the Hawks. Taunton, 304 @ Dighton-Rehoboth, 242 – Final – Taunton’s Jack Patneaude shot a team-low round of 41 for the Tigers. Canton, 2 @ Mansfield, 4 – Final – Mansfield netted a pair of goals in each half in a win over visiting Canton. Senior Sam Hyland finished with a goal and three assists to pace the Hornets. Hyland opened the scoring 10 minutes into the match, taking a through ball from Luke Savoie. Five minutes later, Nick Wisnieski netted his first goal, finishing a throw from Hyland. Early in the second half, Wisnieski made it 3-0 off a cross from Hyland but Canton quickly made it a one-goal game. Junior Griffin Roach scored a pair of goals in a 10-minute span to make it 3-2 but Jared Gabrilowitz nodded home a throw from Hyland in the 79th minute to ice the game. Foxboro, 0 @ King Philip, 1 – Final – King Philip found the game winner in the final five minutes for the second straight game. Tony Bozza played a 1-2 combination with senior Thomas Lugten to get in behind the defense and the junior calmly finished in the 78th minute to give the Warriors two points. Milford, 1 @ Franklin, 2 – Final – Franklin netted a pair of second half goals to erase a one goal deficit to earn its first win of the 2017 season. Milford’s Andre Oliveira put the visitors ahead in the first half but Franklin drew level midway through the second half. Sophomore Jacob Cummings made it 1-1 before the Panthers found the winner in the final two minutes. Sophomore Sam Stowell buried a penalty kick for the game-winner. Milford head coach Brian Edwards said Lucas Caetano had a strong game for the Hawks at left back. North Attleboro, 2 @ Taunton, 2 – Final – Taunton netted the go-ahead goal with less than five minutes to play but North Attleboro found an equalizer with just two minutes to play to earn a draw. The Tigers took the lead in the fourth minute when Francois Hennaux capitalized on a ball over the top and scored on a breakaway. North tied the game in the 60th minute when Gabe Pinhancos volleyed home a cross from Connor MacIver. The Tigers regained the lead when Liam Crowley buried a penalty kick but Pinhancos netted his second, again on a volley, on a cross from junior Joe Hilf. Sharon, 0 @ Oliver Ames, 2 – Final – Oliver Ames scored twice late in the second half to earn two points against Sharon. After hitting the post twice, the Tigers converted when senior Matt Alvarado’s cross found classmate Brandin Osborne, who buried his chance in front. Just before the halftime whistle, Alvarado found Nathaniel Cardoza, who rocketed his shot off the crossbar and in from distance for OA’s second goal. Attleboro, 2 @ Stoughton, 1 – Final – Click here for a recap of this game. Mansfield, 5 @ Canton, 3 – Final – Cassidy McMahon scored a brace for the Hornets, including the eventual game-winner in the second half, to help the Hornets hold off Canton in what Mansfield coach Kevin Smith called “a great game.” Bryn Anderson opened the scoring for the Hornets and Emily Vigeant added a second off a free kick. Canton got one back before McMahon scored her first for a 3-1 halftime lead. The Bulldogs again cut the lead to one but McMahon’s second made it 4-2. With five minutes left, Canton made it a one-goal game, but Emma Oldow sealed the points with Mansfield’s fifth. King Philip, 4 @ Foxboro, 2 – Final KP scored three goals in the opening 12 minutes of the second half to overcome a one-goal deficit and make it four wins in four games. Ally Stanton scored the opener for KP off an assist by Avery Snead. Foxboro took the lead before halftime as Jordyn Collins scored off a Lily Sykes assist and the returned the favor by assisting on a Sykes goal. Chloe Layne tied it four minutes into the second half off an Emma Corcoran pass and then assisted on a goal by Snead three minutes later to take the lead for good. Five minutes later, Makayla Griffin scored off an Abby Baker assist to wrap up the scoring. Taunton, 0 @ North Attleboro, 4 – Final – North Attleboro’s offense clicked on Monday, creating 21 shots and 11 corners. Haley Guertin opened the scoring in the first half off an Emily Chiasson assist, then created a second goal for Leah Jette. Jette then set up Ashley Gaulin to make it 3-0 and Britta MacDonald closed out the scoring off an assist by Meghan Slaney. Rachel Labonte played well defensively to secure the clean sheet. Oliver Ames, 4 @ Sharon, 2 – Final – Jackie Mills scored a brace for the Tigers, while Briana Gibson and Abby Hodges each added a goal apiece. Ally Filipkowski scored on a header off a Bridget McManus pass and Sabrina Robbins scored her first varsity goal off an assist by Bella Berger. All six goals were scored in the final 25 minutes of the game. Attleboro, 7 @ Sharon, 0 – Final – Attleboro’s Grace Mayer and Alex Compton each recorded a hat trick in the Bombardiers win on the road. Abigail Boudreau added the other goal for Attleboro while Katie Pelletier turned away eight shots for the shutout. King Philip, 2 @ Canton, 0 – Final – King Philip finally broke through in the second half, netting a pair of goals to beat Canton on the road. The Warriors had a large advantage in shots in the game. Alli Meehan opened the scoring with 12 minutes left in the game and then Christina Hathaway added an insurance goal, finishing a corner on an assist from Dana Truini with less than three minutes to play. Canton senior goalie Riley Brown made 25 saves, including denying a penalty stroke. Franklin, 1 @ Foxboro, 3 – Final – Click here for a recap of this game. Mansfield, 1 @ Stoughton, 0 – Final – Mansfield’s Tori Farrington scored the lone goal of the game, finding the back of the net just before the midway point of the second half to help the Hornets earn a win on the road. Mansfield’s Kayla Hunter made four saves in the second half to preserve the shutout. Stoughton’s Gianna Barbosa made 15 saves in net for the Black Knights. Taunton, 6 @ Milford, 1 – Final – Taunton senior Kya Enos found the back of the four times and registered one assist to lead the Tigers to a big win on the road. Enos scored Taunton’s first two goals, the latter on an assist from freshman Alana Tavares. Diana Brens made it 3-0 on a feed from Enos and then Enos scored two straight goals, the first from Jillian Pagliuca. Lauren Torres capped the scoring with an assist from Mabel Smith. Junior Emma Sheehan made seven saves in the win. THS head coach Liz Hathaway said Smith, Tavares and Kathryn Robinson had strong games for the Tigers. Oliver Ames, 2 @ North Attleboro, 2 – Final – Kayla Lozzi and Liz Nuss each scored for Oliver Ames while Caitlin Grant made nine saves to help the Tigers earn a tie on the road. Stoughton, 3 @ Attleboro, 0 – Final – Stoughton senior captain Val Whalen combined with juniors Molly Turner and Hanna Holden for 37 service points. SHS coach Erica Batchelder said solid defense from the entire Black Knight squad led the team to the win. Canton, 0 @ Mansfield, 3 – Final – Mansfield recorded a sweep over visiting, earning a key win in the second set to get the win (25-18, 29-27, 25-16). For Mansfield, Julia Harrison had 14 kills and eight digs, Lexi Gardner had 18 service points, Meg Hill added 11 kills and 12 service points and Jolie O’Neil had nine digs. CHS head coach Pat Cawley said sophomore Taylor Harris had a good all around game with great serving including four aces, three blocks, and four kills. Hannah Jerrier added four kills and five blocks for the Bulldogs. Foxboro, 0 @ King Philip, 3 – Final – King Philip earned a 25-10, 25-17, 25-6 sweep over the visiting Warriors of Foxboro. Rachel Veilleux led the way with 21 assists and 15 service points, Sydney Phillips added 11 kills and three digs, Michael Palumbo finished with five kills and five aces and Elise Pereira chipped in with four digs and three aces. North Attleboro, 3 @ Taunton, 1 – Final – North Attleboro picked up a win on the road with a 25-17, 22-25, 25-10, 25-13 decision over Taunton. Kezia De La Cruz recorded a team-high 18 kills and added six aces for the Rocketeers while Amelia Murphy added seven kills and four aces. Sharon, 3 @ Oliver Ames, 2 – Final – Sharon pulled out its second straight five set win, this time on the road at Oliver Ames (14-25, 25-22, 25-21, 22-25, 15-6). Oliver Ames’ Sadie Homer had 19 digs and two aces, sophomore Ally Kemp had 33 assists and three aces, senior Katie Flynn had 10 kills, senior Jackie Kandar added eight kills and three assisted blocks and sophomore Jordyn Vella chipped in with seven blocks and four kills. Canton, 155 @ Milford, 166 – Final – Canton’s Jack Goyetch earned match medalist honors, carding a low-round of 37 as the Bulldogs opened the season with a win. Joey Vaughan shot a 38 for Canton. Milford’s Riley Lynch had a team-low round of 39. 1st Quarter: (S) Aaron Strong 41 yard rush, Mitchell Director XP good. 2nd Quarter: (S) Jeremy Ruskin 9 yard rush, M. Director XP good; (S) Sam Spencer 45 yard interception return, XP blocked; (S) J. Ruskin 14 yard pass to Austin Dodes, XP failed. 3rd Quarter: (S) J. Ruskin 41 yard pass to A. Dodes, XP blocked. 4th Quarter: (R) Randolph 10 yard pass, 2pt conversion failed; (R) Randolph 52 yard pass, 2pt pass good. Mansfield, 2 vs. Brockton, 2 – Final – Mansfield scored inside the first minute of the game and once again in the final moments of the game to finish level with the visiting Boxers. Senior Jared Gabrilowitz nodded in a long throw from Sam Hyland in the opening minute to put the hosts up 1-0. Brockton tied the game before half and then took the lead, finishing off an attacking third set piece. But in the final minutes, Cullin Anastasia drew a penalty kick and converted the chance himself to bring Mansfield even. Franklin, 1 vs. Algonquin, 1 – Final – Freshman Erin Quaile scored the goal for the Panther off an assist by sophomore Carly Alston. King Philip, 5 @ Walpole, 1 – Final – Sophomores Chloe Layne and Avery Snead each scored a pair of goals to help KP cap a three-win week. Layne opened the scoring with a volley off a Riley Magane and made it 3-0 with an olimpico (direct from a corner). Snead doubled the KP lead early in the second half with a shot to the far post and made it 4-0 when she finished off an Emma Corcoran corner. Jenna Midura finished the scoring with her first goal of the season. Emma Durant made three saves in the win. Below are the official Hockomock League Boys Swimming All Stars, selected by the coaches in the league. MILFORD, Mass. 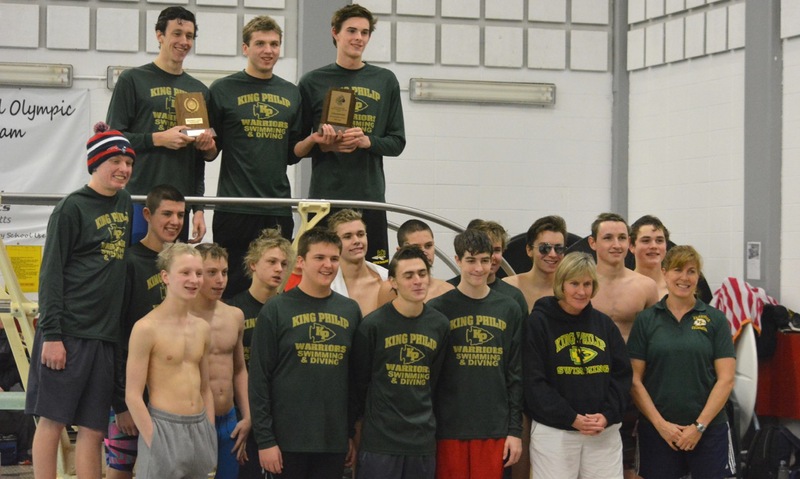 – After one year without a title, perennial league power King Philip is back on top at the Hockomock Boys Swimming Championship. 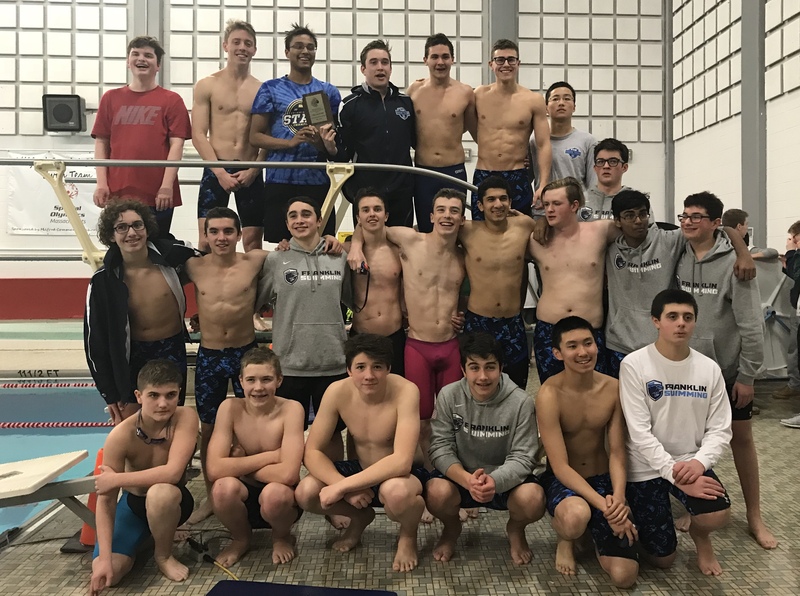 The Warriors, who finished third in 2015, finished with an overall total of 361 and won by nearly 100 points over second place on Sunday at the Milford High natatorium. Remarkably, the Warriors got first place finishes in two of the first four events, but no other firsts for the remainder of the meet. The 200-yard medley relay team of Tim McQuaid, Tyler Stringfellow, Alex DiGiacomo, and Jack Poppenberger took first (and the double points) and DiGiacomo added a first place in the 50-yard freestyle. Although there were no other event winners, KP continued to accumulate points by placing a number of swimmers in the top positions. Stringfellow and Poppenberger finished in second and third in the 200- and 500-yard free, Andy Sprague added a fifth to DiGiacomo’s first in the 50-yard free, DiGiacomo and Dean Whyte took third and fifth in the 100-yard fly, and Tim McQuaid and Colby Vieira took second and fourth in the 100-yard backstroke. “We have a lot of kids who do a lot of things and are willing to do what you ask them to and step into roles where they might not be comfortable,” said White. In second place overall was Attleboro with 269 points, which was by far the Bombardiers’ best finish at the Hockomock Championship. According to head coach Rory Germain, when the Bombardiers joined the league they stood little chance of challenging for the title and had yet to finish higher than eighth, but now can compete with the Hock’s best. Attleboro had five first-place finishers on Sunday. Dylon Willis took first in the 100-yard free and 100-yard breaststroke and freshman River Wright made a splash in his first league meet, taking first in two events, including the 100-yard fly in which he edged out Milford’s Nick Antonellis, who he knows well from club swim, by less than a second. Wright also won the 200-yard IM by five seconds and was part of the 400-yard free relay team, along with Nate Tellier, Colin Parkinson, and Willis, which fell behind by a couple of body lengths to the team from Sharon but managed to get nearly even after the third leg and then won by four seconds after River’s closing push. Wright did not try to contain his excitement at being able to share the excitement with teammates, in what is at the highest levels a very individual sport. Davenport dual meet champion Sharon took third overall and Canton finished in fourth led by Sebastian Melendez, who took first in the 200- and 500-yard free and joined with Diego Ferstler, Sean Mitchell, and Owen Guerini to take first in the 200-yard free relay. In the end, the Warriors had enough depth to finish well in front and got back on top of the podium (or diving board, as the case may be) after a brief, one-year hiatus.